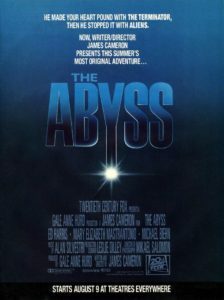 039b – The Abyss | All Eighties Movies. All The Time! This week we’re rounding out our deep look in to the Abyss. People might die, aliens might be seen and Bud kicks back to enjoy the view 5ooo meters down at the bottom of the ocean. Our promo this week is for the “So I married a movie geek” podcast – check them out HERE! Gidgit also had a fun time co-hosting the Two Peas on a Podcast with Gerald last week. Check out their great podcast HERE! Perfection. Even better than first half which was fantastic. I’m a happy Micheal let me tell you. I’ll be listening to this over and over again. Looking forward to Colonels gifs from this part of the movie! You nailed every part of this awesome movie. Thank you so much for the podcast and trivia which is always brilliant. Keep up the good work. Can’t wait for Batman and agree – Keaton is still the best batman. Go Gidgit. New to your pod casts. I love The Abyss and follow Gidgit so had to listen to both parts. Makes me want to re-watch it SO badly now. Have not seen it for years but will find a way to see it again. I forgot how awesome this movie was. Will check out other pod casts. Total eighties girl here. Geezers The Abyss two part podcast. You both really love eighties movies! This is my favorite eighties movie. I cannot thank you both enough. What an epic movie & 2 part podcast. You are both amazing. I have to drive 2 hrs to work & back & your podcast of The Abyss satisfied me so much I had to comment.